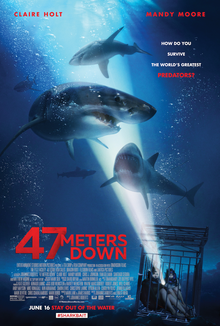 Movie Meme - "Don't Get Out Of The Cage"
Dive shark terror film, 47 Meters Down almost didn't make it into theatres (film distributors didn't think it would draw) yet it has now grossed $34.1 million US in a coupla weeks. Interest in shark cage diving has increased to the point that there are two movies out this summer featuring Great Whites and Sharks. I am off to Barbados on Wednesday for a spot of diving and checking out Crop Over carnival prep. Will try to avoid Jaws in and out of the water. 47 Meters Down is a 2017 British Blood 'N' Bubble shark horror film directed by Johannes Roberts, written by Roberts and Ernest Riera and starring Mandy Moore, Claire Holt, Chris J. Johnson, Yani Gellman, Santiago Segura and Matthew Modine. The film was made in an English film studio (The Underwater Studio) in Basildon, Essex. Two IMBD trivia bits: "Mandy Moore and Claire Holt learned how to scuba dive for this movie. Neither actress scuba dived before.To replicate the organisms found underwater, finely chopped broccoli was added to the tank. Mandy Moore said it compared it to filming in soup." Gotta say this is one shark terror movie I am going to take a pass on if the trailer accurately shows what it is all about ( I am writing this as I pack for a dive trip tomorrow in Barbados). Movie is tentatively titled: Open Water 3: Cage Dive, which is set to hit select theaters on August 11, 2017, and it gives us a first look at some serious Great White shark/human carnage. The movie was written by Gerald Rascionato, filmed in Australia and stars Australia's Joel Hogan, Megan Peta Hill, and Josh Potthoff. 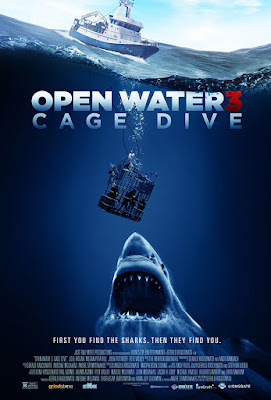 According to Horrorpedia the film’s working titles were Under The Deep and Cage Dive. The Trailer, now on Youtube a little tough for divers to watch https://youtu.be/etnN5Adg6qM. Blood 'N' Bubbles Bucket List. Things that Blood 'N' Bubbles fans should do before they die! If I ever put together a bucket list, the Santa Monica Pier, in LA, California, would be on that wishlist. Why? Earlier this year the Pier added a new ride. Shark Frenzy takes a spin on a classic amusement park ride. Shark Frenzy features 7 species of Shark. Choose the Shark you want to ride in and whirl around on the famous pier built into the Pacific Ocean. 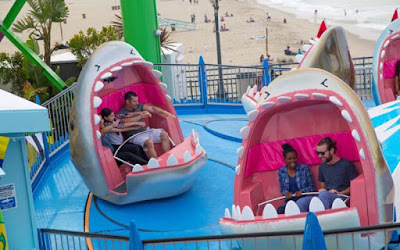 Shark Frenzy was inspired by the classic tilt-a-whirl rides that have been a mainstay of amusement parks for 100 years.